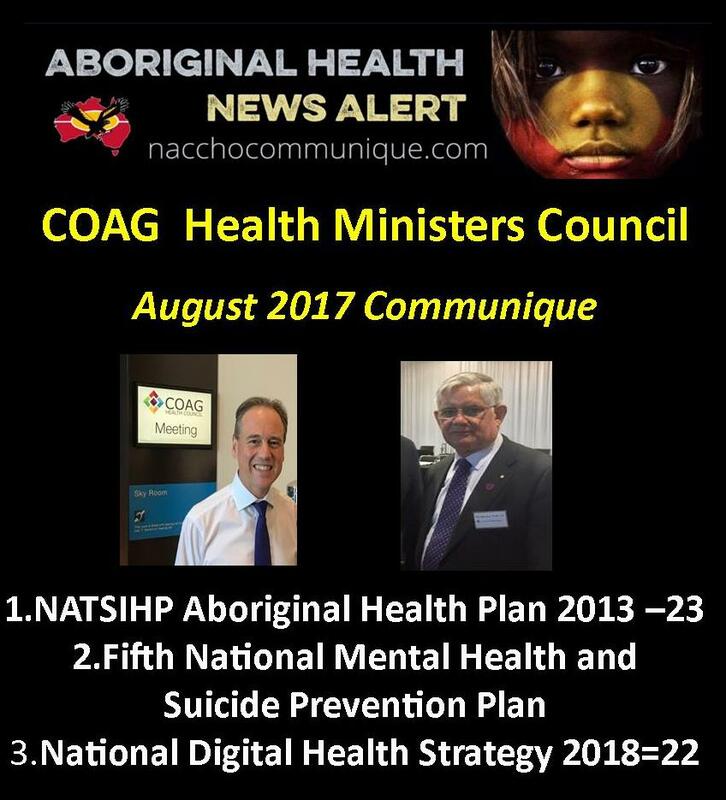 ” The Federal Minister for Indigenous Health, Ken Wyatt, attended the COAG Health Council discussed the Commonwealth’s current work on Indigenous health priorities. 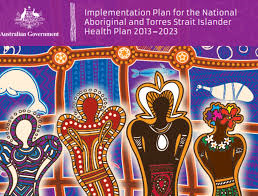 In particular this included the development of the 2018 iteration of the Implementation Plan for the National Aboriginal and Torres Strait Islander Health Plan 2013-2023 that will incorporate strategies and actions to address the social determinants and cultural determinants of health. Ministers also considered progress on other key Indigenous health issues including building workforce capability, cultural safety and environmental health, where jurisdictions can work together more closely with the Commonwealth to improve outcomes for Aboriginal and Torres Strait Islander peoples. Ministers acknowledged the importance of collaboration and the need to coordinate activities across governments to support a culturally safe and comprehensive health system. The federal, state and territory Health Ministers met in Brisbane on August 4 at the COAG Health Council to discuss a range of national health issues. The meeting was chaired by the Victorian Minister for Health, the Hon Jill Hennessy MP. Health Ministers welcomed the New South Wales Minister for Mental Health, the Hon Tanya Davies MP, the Victorian Minister for Mental Health, the Hon Martin Foley MP, the ACT Minister for Mental Health Mr Shane Rattenbury and the Minister for Aged Care and Minister for Indigenous Health, the Hon Ken Wyatt AM, MP who participated in a joint discussion with Health Ministers about mental health issues. Mr Andrew Forrest joined the meeting to address Health Ministers in his capacity as Chairman of the Minderoo Foundation to discuss the Eliminate Cancer Initiative. The Minderoo Foundation is one of Autralia’s largest and most active philanthropic groups. It has established the Eliminate Cancer Initiatve (the Initiative), a global initiative dedicated to making cancer non-lethal with some of the world’s leading global medicine and anti-cancer leaders. The Initiative is a united effort to convert cancer into a non-lethal disease through global collaboration of scientific, medical and academic institutes, commercially sustained through the support of the philanthropic, business and government sectors worldwide. Australia has a critical role to play in this highly ambitious and thoroughly worthwhile goal. Today, Health Ministers discussed the significant health impacts on those people experiencing family violence. Health Ministers acknowledged that health-care providers, particularly those in a primary care setting, are in a unique position to create a safe and confidential environment to enable the disclosure of violence, while offering appropriate support and referrals to other practitioners and services. Recognising the importance of national leadership in this area, Ministers agreed to develop a plan to address barriers to primary care practitioners identifying and responding to patients experiencing family violence. Ministers also agreed to work with the Royal Australian College of General Practitioners to develop and implement a national training package. Health Ministers endorsed the Fifth National Mental Health and Suicide Prevention Plan 2017-2022 and its Implementation Plan. The Fifth Plan also responds to calls for a national approach to address suicide prevention and will be used to guide other sectors and to support health agencies to interact with other portfolios to drive action in this priority area. Ongoing collaboration and engagement across the sector and with consumers and carers is required to successfully implement the Fifth Plan and achieve meaningful reform to improve the lives of people living with mental illness including the needs of children and young people. Health Ministers also agreed that mental health workforce issues would be considered by the Australian Health Ministers’ Advisory Council. Health Ministers agreed to establish a time-limited working group to progress the Commonwealth’s National Psychosocial Supports program. This will have the objective of developing bilateral agreements to support access to essential psychosocial supports for persons with severe mental illness resulting in psychosocial disability who are not eligible for the NDIS. Those bilateral agreements will take into account existing funding being allocated for this purpose by states and territories. Health Ministers agreed to proceed with amendments to the Health Practitioner Regulation National Law (the National Law) to strengthen penalties for offences committed by people who hold themselves out to be a registered health practitioner, including those who use reserved professional titles or carry out restricted practices when not registered. Ministers also agreed to proceed with an amendment to introduce a custodial sentence with a maximum term of up to three years for these offences. These important reforms will be fast tracked to strengthen public protection under the National Law. Preparation will now commence on a draft amendment bill to be brought forward to Ministers for approval, with a view to this being introduced to the Queensland Parliament in 2018. The Western Australian Parliament is also expected to consider legislative changes to the Western Australian National Law. Health Ministers agree that protecting the public from harm is of paramount importance as is supporting practitioners to seek health and in particular mental health treatment as soon as possible. Health Ministers agreed that doctors should be able to seek treatment for health issues with confidentiality whilst also preserving the requirement for patient safety. A nationally consistent approach to mandatory reporting provisions will provide confidence to health practitioners that they can feel able to seek treatment for their own health conditions anywhere in Australia. Agree for AHMAC to recommend a nationally consistent approach to mandatory reporting, following discussion paper and consultation with consumer and practitioner groups, with a proposal to be considered by COAG Health Council at their November 2017 meeting, to allow the amendment to be progressed as part of Tranche 1A package of amendments and related guidelines. Health Ministers approved the National Digital Health Strategy and the Australian Digital Health Agency Work Plan for 2018-2022. The Strategy has identified the priority areas that form the basis of Australia’s vision for digital health. This Strategy will build on Australia’s existing leadership in digital health care and support consumers and clinicians to put the consumer at the centre of their health care and provide choice, control and transparency. Health Ministers supported Queensland and other interested jurisdictions to collaboratively identify options in relation to aligning patient safety and quality reporting standards across public and private hospitals nationally. Ministers agreed that the Australian Commission on Safety and Quality in Health Care (ACSQHC) would undertake work with other interested jurisdictions to identify options in relation to aligning public reporting standards of quality healthcare and patient safety across public and private hospitals nationally. The work be incorporated into the national work being progressed on Australia’s health system performance information and reporting frameworks. Health Ministers noted that human biomonitoring data can play a key role in identifying chemicals which potentially cause adverse health effects and action that may need to be taken to protect public health. Health Ministers agreed that a National Human Biomonitoring Program could be beneficial in assisting with the understanding of chemical exposures in the Australian population. Accordingly, Ministers agreed that the Australian Health Ministers’ Advisory Council will explore this matter in more detail by undertaking a feasibility assessment of a National Human Biomonitoring Program. States and territories expressed significant concern that the proposed Direction to IHPA will result in the Commonwealth retrospectively not funding activity that has been already delivered by states and territories but not yet funded by the Commonwealth. States and territories were concerned that this could reduce services to patients going forward as anticipated funding from the Commonwealth will be less than currently expected. The Commonwealth does not agree with the concerns of the states and territories and will seek independent advice from the Independent Hospital Pricing Authority (IHPA) to ensure hospital service activity for 2015-2016 has been calculated correctly. The Commonwealth committed to work constructively and cooperatively with all jurisdictions to better understand the drivers of increased hospital services in funding agreements. Health Ministers discussed a paper by Western Australia on legitimate and unavoidable costs of providing public hospital services in Western Australia, particularly in regional and remote areas, and recognised that those matters create a cumulative disadvantage to that state. Health Ministers acknowledged that Western Australia will continue to work with the Commonwealth Government and the Independent Hospital Pricing Authority to resolve those matters. Health Ministers unanimously confirmed the importance of vaccination and rejected campaigns against vaccination. All Health Ministers expressed their acknowledgement of the outgoing Chair, the Hon Ms Jill Hennessy and welcomed the incoming Chair Ms Meegan Fitzharris MLA from the Australian Capital Territory. Digital information is the bedrock of high quality healthcare. The benefits for patients are signicant and compelling: hospital admissions avoided, fewer adverse drug events, reduced duplication of tests, better coordination of care for people with chronic and complex conditions, and better informed treatment decisions. Digital health can help save and improve lives. To support the uptake of digital health services, the Council of Australian Governments (COAG) Health Council today approved Australia’s National Digital Health Strategy (2018-2022). Australian Digital Health Agency (ADHA) CEO Tim Kelsey welcomed COAG approval for the new Strategy. “Australians are right to be proud of their health services – they are among the best, most accessible, and efficient in the world. Today we face new health challenges and rapidly rising demand for services. It is imperative that we work together to harness the power of technology and foster innovation to support high quality, sustainable health and care for all, today and into the future,” he said. The Strategy – Safe, seamless, and secure: evolving health and care to meet the needs of modern Australia – identifies seven key priorities for digital health in Australia including delivery of a My Health Record for every Australian by 2018 – unless they choose not to have one. More than 5 million Australians already have a My Health Record, which provides potentially lifesaving access to clinical reports of medications, allergies, laboratory tests, and chronic conditions. Patients and consumers can access their My Health Record at any time online or on their mobile phone. The Strategy will also enable paper-free secure messaging for all clinicians and will set new standards to allow real-time sharing of patient information between hospitals and other care professionals. Australian Medical Association (AMA) President Dr Michael Gannon has welcomed the Strategy’s focus on safe and secure exchange of clinical information, as it will empower doctors to deliver improved patient care. archaic. The AMA has worked closely with the ADHA on the development of the new strategy and looks forward to close collaboration on its implementation,” Dr Gannon said. Royal Australian College of General Practitioners (RACGP) President Dr Bastian Seidel said that the RACGP is working closely and collaboratively with the ADHA and other stakeholders to ensure that patients, GPs, and other health professionals have access to the best possible data. “The Strategy will help facilitate the sharing of high-quality commonly understood information which can be used with confidence by GPs and other health professionals. It will also help ensure this patient information remains confidential and secure and is available whenever and wherever it is needed,” Dr Seidel said. Pharmacy Guild of Australia National President George Tambassis said that technology would increasingly play an important role in supporting sustainable healthcare delivery. “We are working with the ADHA to ensure that community pharmacy dispensing and medicine-related services are fully integrated into the My Health Record – and are committed to supporting implementation of the National Digital Health Strategy as a whole,” George Tambassis said. Pharmaceutical Society of Australia (PSA) President Dr Shane Jackson said that the Strategy would support more effective medicationmanagement, which would improve outcomes for patients and improve the efficiency of health services. “There is significant potential for pharmacists to use digital health records as a tool to communicate with other health professionals, particularly during transitions of care,” Dr Jackson said. The Strategy will prioritise development of new digital services to support newborn children, the elderly, and people living with chronic disease. It will also support wider use of telehealth to improve access to services, especially in remote and rural Australia and set standards for better information sharing in medical emergencies – between the ambulance, the hospital, and the GP. Consumers Health Forum (CHF) Leanne Wells CEO said that the Strategy recognises the importance of empowering Australians to be makers and shapers of the health system rather than just the users and choosers. “We know that when consumers are activated and supported to better self-manage and coordinate their health and care, we get better patient experience, quality care, and better health outcomes. “Digital health developments, including My Health Record, are ways in which we can support that to happen. It’s why patients should also be encouraged to take greater control of their health information,” Leanne Wells said. Medical Software Industry Association (MSIA) President Emma Hossack said that the Strategy distils seven key themes that set expectations at a national level.“The strategy recognises the vital role industry plays in providing the smarts and innovation on top of government infrastructure. This means improved outcomes, research, and productivity. Industry is excited to work with the ADHA to develop the detailed actions to achieve the vision which could lead to Australia benefitting from one of the strongest health software industries in the world,” Emma Hossack said. Health Informatics Society of Australia (HISA) CEO Dr Louise Schaper welcomed the Strategy’s focus on workforce development. “If our complex health system is to realise the benefits from information and technology, and become more sustainable, we need clinical leaders with a sound understanding of digital health,” Dr Schaper said. The Strategy was developed by all the governments of Australia in close partnership with patients, carers and the clinical professionals who serve them – together with leaders in industry and science. The Strategy draws on evidence of clinical and economic benefit from many sources within Australia and overseas, and emphasises the priority of patient confidentiality as new digital services are implemented. The ADHA has established a Cyber Security Centre to ensure Australian healthcare is at the cutting edge of international data security. The ADHA, which has responsibility for co-ordinating implementation of the Strategy, will now be consulting with partners across the community to develop a Framework for Action. The framework will be published later this year and will detail implementation plans for the Strategy. Today was a huge breakthrough in terms of mental health. The Fifth National Mental Health Plan was approved by the states. What this is about is enormous progress on suicide prevention. It has actually become the Fifth National Mental Health and Suicide Prevention Plan, so a real focus on suicide prevention. In particular, the focus on what happens when people are discharged from hospital, the group in Australia that are most likely to take their own lives. We actually know not just the group, but the very individuals who are most at risk. That’s an enormous step. The second thing here is, as part of that plan, a focus on eating disorders, and it is a still-hidden issue. In 2017, the hidden issue of eating disorders, of anorexia and bulimia, and the prevalence and the danger of it is still dramatically understated in Australia. The reality is that this is a silent killer and particularly women can be caught up for years and years, and so there’s a mutual determination, a universal determination to progress on eating disorders, and that will now be a central part of the Fifth National Mental Health and Suicide Prevention Plan. And also, as part of that, we’ve included, at the Commonwealth’s request today, a real focus on early intervention services for young people under 16. Pat McGorry has referred to it as CATs for Kids, meaning Crisis Assessment Teams, and the opportunity. And this is a really important step because, for many families, when they have a crisis, there’s nowhere to turn. This is a way through. So those are all enormous steps forward. The other mental health area where we’ve made big, big progress is on allowing doctors to seek routine mental health treatment. There’s an agreement by all of the states and territories to work with the Commonwealth on giving doctors a pathway so as they can seek routine mental health treatment without being reported to the professional bodies. What has led to the increased focus on eating disorders? Has there been an uptick in the number of suicides resulting from that, or has there been an uptick in the number of cases? No, this has been silently moving along. It’s a personal focus. There are those that I have known, and then when we looked the numbers shortly after coming in, and dealt with organisations such as the Butterfly Foundation, they explained that it’s been a high level issue with the worst rate of loss of life amongst any mental health condition. And so that’s a combination both of suicide, but also of loss of life due to physical collapse. And so it’s what I would regard as a personal priority from my own experience with others, but then the advocacy of groups like Butterfly Foundation has finally landed. It should’ve happened earlier, but it’s happening on our watch now. That would be my next question, is that I’m sure advocacy groups will say this is great that it’s happened, but it’s taken the Government so long. Why is it that you’re focussing on it now as opposed to…? I guess, I’ve only just become Minister. So from day one, this is one of the things I’ve wanted to do, and I’m really, personally, deeply pleased that we’ve made this enormous progress. So I would say this, I can’t speak for the past, it is overdue, but on our watch collectively we’ve taken a huge step forward today. Then the last thing is I’ve seen some reports that Queensland and Victoria may have been upset that some of their statistical anomalies were referred to what’s called IHPA (Independent Hospital Pricing Authority). The reason why is that some of their figures simply didn’t pass the pub test. The independent authority will assess them, but when you have 4000 per cent growth in one year in some services, 3300 per cent growth in some years in other services, then it would be negligent and irresponsible not to review them. It may be the case that there was a more than 40-fold increase in some services, but the only sensible thing for the Commonwealth to do is to review it. But our funding goes up each year every year at a faster rate than the states’ funding, and it’s gone up by $7.7 billion dollars since the current health agreement with the states was struck. Is that, sorry, relating to private health insurance, or is that something separate? No, that’s just in relation to, a couple of the states lodged claims for massive growth in individual items. Thank you. So was there a directive given today regarding private health policies to the states? Was that something that was discussed or something that …? Our paper was noted, and the states will respond. So we’ve invited the states to respond, they’ll respond individually. And regarding that mental health plan, besides their new focus on eating disorders, how is it different from previous mental health plans? So, a much greater focus on suicide prevention, a much greater focus on eating disorders, and a much greater focus on care for young children under 16. Is that something that you can give more specific details about? You’re saying there’s a much greater focus, but is there any specific information about what that would mean? As part of the good faith, the Commonwealth, I’ve written to the head of what’s called the Medical Benefits Schedule Review, so the Medicare item review, Professor Bruce Robinson and asked him and their team to consider, for the first time, specific additional treatment, an additional treatment item and what would be appropriate for eating disorders.